Between school, work and sports, it can be difficult to find time together as a family around the table. 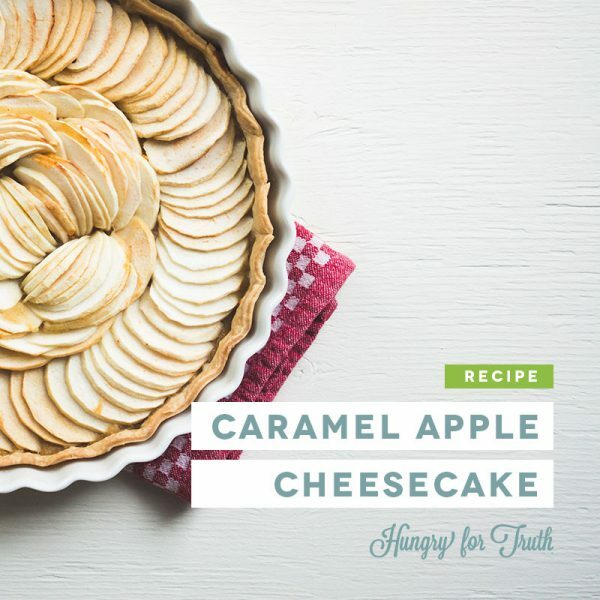 Baking a caramel apple cheesecake is one way to bring your family to you for some much-needed face time. With harvest time for apples running alongside with soybean harvest, farmers use meal time in their combines to spend time with their families. Did you know the animal agriculture industry consumes 98 percent of soybeans grown in the United States? Soybeans are part of a healthy, balanced diet for many animals. Pigs, chickens, turkeys and cows eat soybeans for protein to keep them happy and healthy. Healthy animals create healthy foods! One example is the dairy cows that gave milk to supply the cream cheese for this recipe. If you don’t have time to bake, we suggest heading to Country Apple Orchard to pick up a fresh baked sweet treat. Bring your kids along and make some memories by picking apples or pumpkins and enjoying other activities. Read more about how the Kroger family business connects with the community. Spoon 3/4 can apple pie filling into the crust. Add the remaining 1/4 can filling to a small saucepan and mix with the caramel. Heat over low heat until melted and spreadable (about 1 minute). Whip the cream cheese in a large bowl until fluffy. Add the sugar, vanilla, and eggs. Beat until smooth (a few seconds). Pour over the pie filling. Bake until the center of the cake is set (30-35 minutes). Cool to room temperature. Spoon the apple-caramel mixture over the top of the cheesecake and spread evenly. Decorate the edge of the cake with pecan halves and sprinkle with chopped pecans. Sounds good, but I was really looking for something more healthy for a diabetic. What does awaiting moderation mean? You weed out the responses you don’t like to post??? Thanks for your question! We review comments just to make sure language is appropriate and it’s coming from a legitimate – not spam.